If you sell stuff online and receive payments using Paypal you probably already know that you have two options for the payment fee with Paypal. One is the standard 2.9% commission + ¢30 transaction fee. The other is so called Micropayment Discount or 5% + ¢5 per transaction. The latter, as Paypal says, is better if your typical sales are less than $10. But how much better and what is typical? - are the questions that neither Paypal nor anybody else can answer for you. 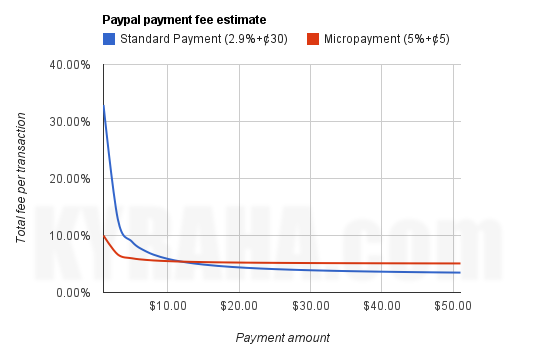 Here is a simple graph showing the total percentage you'd pay to Paypal from your merchant profit depending on the transaction amount. The graph is to help you understand your odds. Below is my humble "analysis". For ridiculously small amounts, like less than a dollar, collecting any money might be not a very good idea at the first place. You'd gain more if you gave it for free. So lets start with $1, a simple smartphone app for example. If you didn't apply for Micropayment Discount you'd give 33% (every third dollar) of your profit to Paypal, or just 10% (every tenth dollar) if you did. And the difference is pretty much significant for anything significantly less than $10. If your merchandise costs mostly around $10, especially if it's assorted and the price is spread up to $15 or more then you might don't want even to bother to apply for Micropayment Discount. It's not going to save you much. Moreover, if you're closer to $20 side you're going to lose with Micropayment Discount. Stay standard. For larger payments, $30 and more, the graphs flatten around 3% and 5% respectively. This means that if your Paypal account configured with Micropayment Discount you're going to pay 2% more for Paypal's processing services than you'd do with their standard fee plan. Not a big deal for occasional moderate spikes while majority of your sells are under $10. But definitely no-go for really big payments and/or when most of your transactions are above $10.